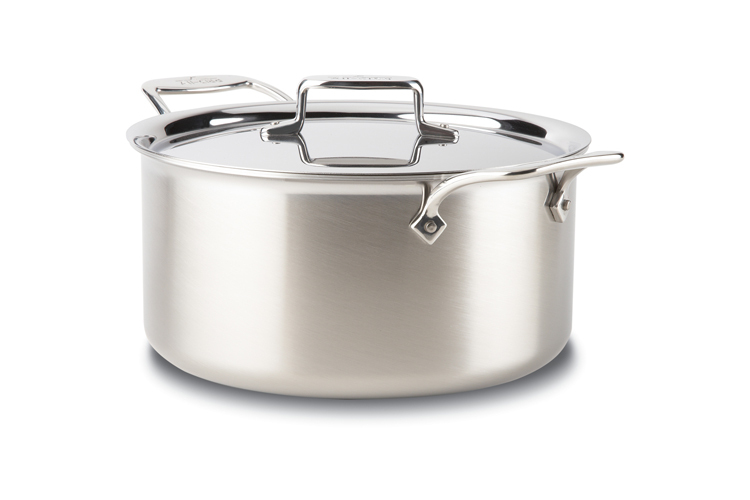 All-Clad Stockpots are wonderful for making stocks, soups and simmering large quantities of liquids. They have straight sides and are deep enough to be very versatile. All-Clad Stainless Stockpots have two of the company's signature loop handles for easy carrying, lids fashioned from gleaming 18/10 stainless steel, and highly durable, stainless steel rivets. All-Clad d5 cooksware keeps the classic styling of All-Clad's popular and best selling Classic Stainless Steel Cookware - while adding to that the technological advances of their new d5 technology. The patented technology used in All-Clad d5 cookware incorporates 5 alternating layers of higher and lower conductivity metals to promote a lateral flow of energy and eliminate hotspots. (18/10 stainless steel interior, then a layer of aluminum, then an 18/10 stainless steel core, another layer of aluminum and finally an external layer of magnetic, brushed stainless steel). In addition to enhancing thermal diffusion, the stainless steel core are the heart of All-Clad d5 significantly improves geometric stability to prevent warping. The magentic stainless steel exterior is optimized for use on induction cooktops and is compatible with other cooktops. The new range of All-Clad d5 cookware has newly designed ergonomic handles and pour lip, which improves its comfort, stability and handling control. All-Clad d5 technology results in consistent, even heating for uniform browning - and offers improved comfort, balance and control. It is dishwasher safe and is designed to provide exceptional cooking results, look beautiful at the table and be safely cleaned in the dishwasher. All-Clad d5 is designed, engineered and manufactured in the USA. All-Clad is renowned for using American-made metals to make handcrafted bonded cookware in the tradition that established a new benchmark for professional bonded cookware. At each stage of the manufacturing process, every piece of All-Clad bonded cookware is hand-inspected to ensure that it maintains All-Clad quality standards. This extreme scrutiny slows the production process, but guarantees that every piece of bonded cookware that leaves the Pennsylvania rolling mill preserves the reputation that precedes it. Every detail receives critical attention. The signature stay-cool handle is cast from solid stainless steel, and is ergonomically-designed for comfort during long cooking sessions. Rivets are formed from high-yield-strength stainless steel, and treated to remove trace elements of iron that could otherwise cause corrosion. These painstaking efforts result in a finished bonded cookware product that maintains the same integrity it was created with, even after a lifetime of service.